What an incredible time for #YouthVoice in our region! On March 31st, youth music ensembles from around the city came together for an evening of inspiring music and fun. #Soundwaves Steelband, Kelly Strayhorn Theater’s premiere after-school steel pan program, was joined by partnering community groups, including #Sankofa Village African Drum and Dance Ensemble, #HopeAcademy Music Ensemble, Pittsburgh Obama Academy Steelpan Ensemble and Ben Barson’s The Way of the Saxophone, in this concert of next-generation musicians sharing their talents. Youth Express was on the scene, broadcasting live. In case you missed it, we will be re-airing the performance in its entirety later this month. Students from Woodland Hills Academy participating in The Youth Media Advocacy Project (YMAP) have launched the Wolverine Creed: Guns & Violence Will Not Define Us and will be hosting a march on April 23rd – learn more about the event here and how you can get involved. 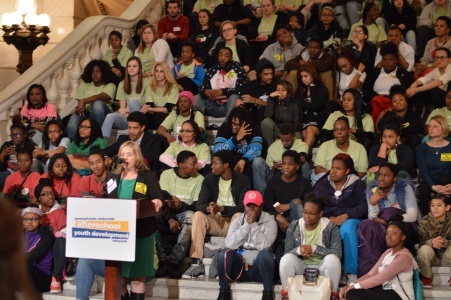 On April 12th, students from across the region boarded a bus to our state capitol to participate in APOST’s After-School Advocacy Day and Youth Express was there, broadcasting live from the East Wing Rotunda of the Pennsylvania State Capitol. Missed the live broadcast? We will be re-airing interviews with youth and program providers next week. Congratulations to all those students from across the state whose voices were heard loud and clear!